I recently got into watching Inuyasha and I was wondering if there are other people here the GC who have watched it/or plan to. I used to watch Inuyasha all the time back when it aired on Adult Swim! I think this was about 2003-2006ish? I never did finish the anime because it started to annoy me with the back and forth between Inuyasha and Kagome. Kagome was getting on my nerves cause she was so mean to Inuyasha all the time. At least thats how I felt back then xD I was considering rewatching it on Hulu since they had it up but i got mad when i saw they didn't even use the original theme songs for the opening on the japanese version. LIKE COME ON. THAT'S MY FAVORITE PART OF INUYASHA TBH. xD The theme songs were the best! Both openings and endings! For me, I liked "Grip!" and "ANGELUS" as the openings and "My will", "Fukai Mori", "Shinjitsu no Uta", and "Come" for the endings. I also really liked the ending to the third movie "Four Seasons". My favorite opening song is "Change the World" by V6 and my favorite ending song is "My Will"
Change the World for the win. I used to fall asleep to the soundtrack when I was younger. I still have the CD somewhere. But, I haven't watched the entire series, because it is just soooo long. SL, where I found Inuyasha! I happen to liked it and looks forward to rewatching it from the beginning to the end. Kagome does control Inuyasha: "SIT BOY!" "Kagome, that hurts". Kagome might not stand Inuyasha, but deep down they loved each other. He's a demon (actually, half-demon) and during the new moon, the moon's power changes his hair color from white to temporary black. Ah Inuyasha, I started watching this in 2002 when it started airing on Adult Swim (I think when it first premiered). It used to be one of my favorites but I guess I outgrew it a bit. I'm quite tempted to start collecting the manga volumes again. I have probably close to 30 of them. I haven't read the manga yet.How is it?Any massive changes from manga to anime? It's been awhile since I read it...but I would say not really if we are talking about the original series. Plot point wise the anime and manga follow the same path and major points. Sure the exact way things happen often differs as far as exactly how various fights went or who made what realization and when (like Naraku trying to kill Kikyo in the anime finding he can not vs already knowing Onigumo would not let him kill her in the manga)...but overall things happen the same. Other than of course the anime has a lot more filler plot. Some of which better explains certain events which are only barely referenced in the manga (for example the anime has more regarding Inuyasha's father than the manga). However overall the manga has much stronger character and relationship development. - Sesshomaru does not dwell on his hatred/rivalry with Inuyasha for very long in the manga. Basically after Sesshomaru gets his own sword and they clash the one time that's pretty much it for his major resentment issues up until he finds out about the swords having to merge where he gets understandably mad until her gets his new sword. He's also shows more of his caring/sympathetic side towards Rin. - Inuyasha is somewhat more emotionally mature especially concerning his feeling towards Kagome. He actually goes on a little more but she falls asleep against his back making him mad. It's a really sweet/cute moment. The anime chose to cut out a lot of these kind of little moments between the two for whatever reason. (Kagome too was more open as you can see...she talked more instead of always just lashing out making him sit nearly as often as she did in the anime). Maybe the felt that because of the medium with all the filler they needed more of an emotional barrier between the two to keep them further apart? - Speaking of which...Kikyo. First of all the manga does a much better job of making her more of a sympathetic tragic character and less of a cold witch as she was for much of the anime. 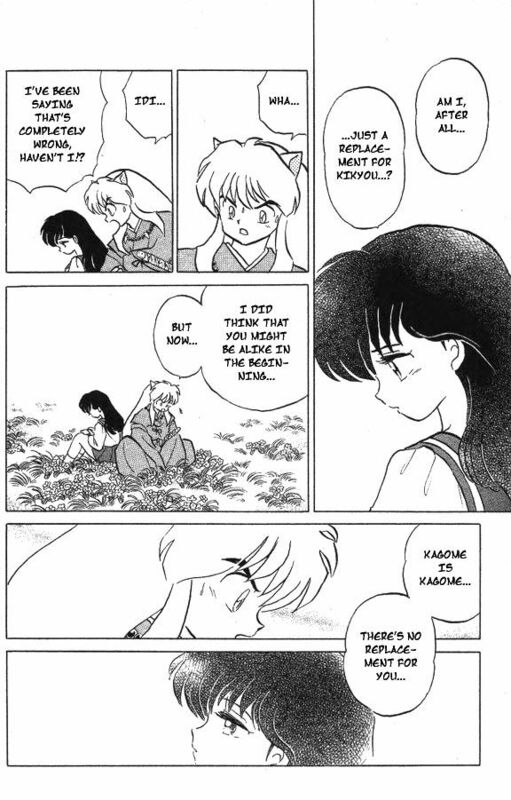 Plus the manga did not seem to ship Kikyo as the epic lost love of Inuyasha with nearly as many heavy romantic/ship related moments that the anime had between the two. - Some of the demons are much stranger looking in the manga. Things are more violent like at one point I think Inuyasha rescues orphans clutching the severed heads of their parents. Now the Final Act is a bit of a different story. They compressed about 20 manga volumes into those 25 episodes so quite a bit of stuff was missing. Nothing major/essential related to the main plot per-say. But there were more than a few demons, sword powerups, and minor plots the Final Act skipped, and other stuff it covered was rushed over with not nearly as much detail as the manga. So yeah...if you are mainly interested in the larger differences then the original series ended at volume 36 (chapter 356) so start there. Yeah both ended. So I believe you are talking about original InuYasha anime's ending which left nothing resolved and was rather abrupt... It was about four years after that anime ended that the manga ended and they released the 26 episode "InuYasha The Final Act" which covered all the remaining material (again a bit rushed since they had to pick and cram so much material in such a small number of episodes) and gave it essentially the same definitive ending as the manga as far as the main Naraku/Shikon-no-tama plot and where all the relationships stood. The anime just ends shortly before the last volume of the manga does and just doesn't have the extra flash further forward epilogue in that last issue plus epilogue story. I'm just starting out watching it. I've seen adorable fanart and I did see an episode or two back in its original airing on adult swim, but could never follow it (could not stay up late to follow it). I think I'm almost 40 episodes in and it is really enjoyable so far. Sure, it's bloodier than what I'm use to in anime, but the violence not distracting or too much that it to make my stomach turn, so I can live with it. It has a great balance between drama and humor. I know that there are fillers that are not well liked in the anime, but I'm going to give the whole thing a shot and try to see the whole show through to the end. And I'd like to thank Brit for giving me some idea what I'd be seeing (nothing spoiler-y) so I'd be comfortable to venture watching it. I've seen up to about episode 52 I think. It's a great story and I love the characters. Well I watched Inuyasha a LONG time ago when Cartoon Network was cool, right now I have a bad memory because I cannot remember if it was during the time when CSS was also airing on CN or if it was when I started college but I do know that I watched all the first version, I haven't seen the Kankestsu-hen which is the one closer to the manga and I'm not sure why I haven't o.o (guess is time to see if crunchyroll has it). and that's my story. I do remember saying a LOT "OSUWARI!" xD. It's on Hulu, Venus . And also Kanketsu-hen isn't "the closer to the manga". It's just the continuation/sequel to the 2000 - 2004 anime. Don't have Hulu, so will try to find it somewhere else. I personally never watched or cared for Inu Yasha at all. I had a lot of friends in school who absolutely loved it. But I rarely hear about it nowadays. I did watch an episode of it at my college anime club once, but that was it. The vid was taken down, now I have to replace with a similar vid still online. And here's "My will" - season 1 ending song (I happen to like it too, crystalbunny). The finale of the original anime series (meaning, not the Final Acts) was good, though it left a lot of doors open (I guess the animators were tired of fillers and just waited for the manga to be finished). That said, while the final acts were good, and filler-free, they also felt fast paced, if you go directly from original to Final. A lot of issues or villains are dealt with quickly, heroes get the power ups quickly as well. But it is good to see these conflicts finally put to rest after so long. The show does have some good characters in it, and the main ones have some good developing relationships. And like I said before, it had a good balance of humor and drama so it wasn't exhausting like it could've been. The story was very good and it was very engaging. I really did like this anime. That said, while the final acts were good, and filler-free, they also felt fast paced, if you go directly from original to Final. A lot of issues or villains are dealt with quickly, heroes get the power ups as well. But it is good to see these conflicts finally put to rest after so long. Yes, it's true that Final Act was very fast paced,the reason is that its episodes cover about 2 to 4 volumes of the manga while the original is really slow paced. But anyway! What is your favorite story arc? What is your favorite story arc? Tough to say, since arc are not a clear-cut like in other shows (ex. Sailor Moon). It felt like an ongoing story. But I guess, I would have to say it was the early episodes where the characters meet each other, and they're collecting the shards. The other being the arc with the Shichinintai ("Band of Seven"), because I was impressed by the length and detail of whole plan devised by the Big Bad. What about you? Any fave arc? I have watched only a couple of episodes of Inuyasha, but I am planning on watching the rest of the episodes when I get the chance. I really like the series and it has a very interesting storyline too. Sadly, the voice actor of Miroku, Kouji Tsujitani, has passed away today. May he rest in peace.